A very variable group ranging from miniature plants to large sgrubs and tree like plants. Many of the smaller plants are much sought after as are some of the hybrids..
A wide range of habitat. This group of plants are members of the Asclepiadaceae and the plants that we have featured exhibit the succulent habit evident in the highly tuberous roots, stems and leaves and are also accompanied by very intricate but in some cases small flowers. All these plants are highly desirable to collectors and are worthwhile to grow. We hope you will try one or two and are sure you will be delighted with them. The Family Euphorbiacea is one of the largest plant families and comprises many genera. As far as the succulent plant enthusiast is concerned the main genera of interest are Euphorbia and Monadenium. 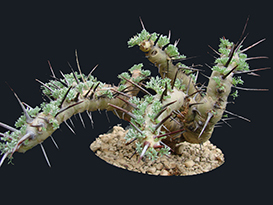 The genus Euphorbia covers a wide and diverse range of plants with the succulent species being found in most of the five continents and showing modes of growth from small geophytes to shrubs of all sizes to large trees. Our range of succulent Euphorbias is probably one of the most comprehensive in the country and covers plants from South Africa and Madagascar as specialities. Euphorbias are a must for every serious succulent enthusiast and we are sure you will find something of interest to add to your collection. This genus has now been re classified as Euphorbia but I feel that there is sufficient variation to maintain the name Monadenium. They can be readily identified by the distinct flower and the plants can take many forms from small geophytic plants to large shrubs. All species are worthwhile to grow , some a little more difficult than others. Pachypodium is a member of the Family Apocynaceae which includes over 200 genera and 2000 species of mainly tropical trees and shrubs. The main characteristic of these plants is their flower form and fruits which develop into a pair of horn like pods packed with seeds. 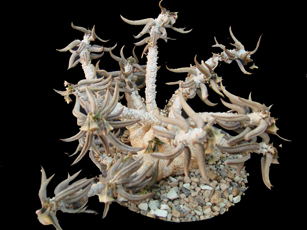 Pachypodium species are showy succulent plants with fairly large brightly coloured flowers in white, red or yellow. The genus has 23 species of which 5 can be found in Southern Continental Africa and 18 in Madagascar. Of the Madagascan species some have only been recently discovered and there are some who would place certain species as varieties of a species. All the Madagascan plants we list have been given the newer species name. Pachypodiums are one of the most sought after genus and our selection is fairly comprehensive and ranges from fairly easy to the more difficult plant. Try some for yourself you will not be disappointed with the shape and form of these unusual plants. Multi branched and usually spiny shrubby plants from South Africa. Pink or white flowers and quite slow growing.. The term Stapeliads is a loose description for members of what used to be the family Asclepiadaceae. The plant Genera belonging to this Family have now been moved to the Family apocynaceae mainly because of the characteristics of the seed pods. There are many unusual plant species to be found in this group and we hope you will find that we have an interesting selection. Please note that we have excluded Brachystellma and Ceropegiia from this section and given them a section to themselves. This range of succulent plants covers everything from the swollen stemmed Adenia of South Africa to the xerophytic tuberous rooted Genus Zygosycios from Madagascar. In between you will find a good selection of Aloes with a lot of Madagascan species and a range of other interesting and unusual plants ranging from the leafy Kalanchoes to small geophtes such as Dorstenia and Gerrardanthus. There will always be something to tempt you here and we aim to bring you a great range of plants to enhance your collection. This selection of bulbs has been specially chosen to encompass some of the more showy and unusual bulbs as well as some of the old favourites like Haemanthus albiflos. Most are quite easy to cultivate and are worthwhile additions to the collection. About UsToobees Exotics have been established for 35 years and is based in Woking in the U.K. During this time we have been supplying the needs of both the beginner and the more experienced collectors with a range of rare and unusual Madagascan and South African succulents and other exotic plants. Making A PurchaseMaking a purchase could not be easier. Just browse our Catalogue, and click on any items that you wish to buy and put them into the shopping basket. After you have finished your selection, click on "Checkout" and you will be asked for a few details that we need to be able to satisfy the order. We accept Visa and Mastercard via Paypal our payment service provider or if you have a Paypal account you can pay direct with that method via our e mail address. At this time it is only possible for us to accept credit card information over the Internet. If you have made a mistake in your order and can not correct it in the shopping basket, contact us and we will correct the mistake. It may sometimes happen that an order is taken before our online shop has had a chance to update and that an ordered item is out of stock. Shipping And HandlingAll plants are sent within the U.K. either by first class post or if packages are too heavy or too large by Parcel Force. Outside the U.K. but within the European Union plants are sent by European Air Mail at the small package rate. Delivery ScheduleWe will normally despatch your order within 14 working days, but we must take into account weather conditions and the type of plants you have selected. If we deem that it is not suitable to send plants because of low temperatures we will advise you of a despatch date. Credit Card SecurityAll credit card numbers are encrypted in the software when the order is placed using 128 bit encryption. They are only decrypted after they reach our computer. They are not held in clear text on any web site. GuaranteeWe guarantee the quality of our plants on dispatch but in the event of any dissatisfaction please contact us immediately on receipt of your package.